If you’re expecting a huge theory lesson that’ll make your eyes roll up inside your head, have no fear. These methods are so easy your cat could do them … if she had opposable thumbs. 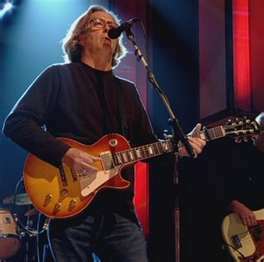 Even Clapton uses a capo. My piano playing friends are so jealous ‘cause there’s nothing like this for them. You slap this little thing on your guitar. Treat it like the top of your strings and use the same chord shapes you normally would use. Voila! Different key. Kyser capo, my favorite kind. There are lots of different kinds out there. What happens if the key is too high for you? 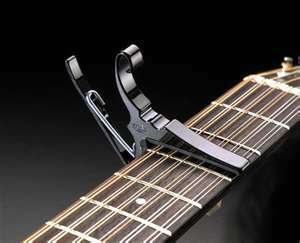 You can still use a capo, just sing an octave lower. Don’t run screaming from the room. Really, it’s simple and I’m only going to throw a tiny bit of theory at you: there’s a half step between B & C and E & F. The distance between other notes (without sharps or flats) is a whole step. Now, remember that ‘cause it’ll come in handy in a minute. Look at the first chord. If you need to raise the key, just take it up a couple of steps. So, if that chord is A, you’ll go up to C. Look at the next chord and go up the same number of steps. 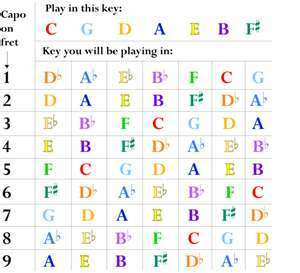 Say it’s a D. That means you’ll go up to an F. Same goes for minor, seventh or any other color of chord. An E minor would change to a G minor. A G7 would change to a B7. So, just count on your fingers! You can also lower the key this way. A G chord could become an E and so on. As long as you’re consistent with the number of steps for each chord and you alter any chords that don’t work, you’re good. Not so scary, eh? Now you can tell people you know some theory. You don’t have to tell them it involves a capo or counting on your fingers. This entry was posted in Playing the guitar and tagged guitar instruction, guitar lessons, learn guitar, music, playing in a different key, transposing chords, transposing guitar chords. Bookmark the permalink.